Friday September 27th – rainy and cold. Second thoughts. Did we pick the right weekend for this mountain climb? The forecast for the next two days was good. Time would tell if it would hold. After the rain and sleet on Friday, the weather cleared up beautifully by very early morning Saturday. I did not sleep well Friday night and peered out the window of my hotel to see a good omen – starry skies. By daybreak Saturday morning we could see snow glistening on the mountain. Hmmm. Crampons and snow shoes were not on the gear list! During our acclimatization hike Saturday morning we discovered there had been a small amount of accumulation in some shady areas of the trail. Maybe half an inch, maybe more in a few places. Given the sunny forecast, and the elevation and dryness, we figured most of the snow would be melted, especially in areas higher up with less tree cover. For our pre-event hike, we trekked up the trail we would be hiking down for the main event. We took a scenic detour away from the summit trail and hiked to a small waterfall. Someone took a wrong turn off the narrow foot trail and lead a few of us over a boulder field. Tricky footwork and balancing distracted us so that by the time we discovered the error, we had reached the waterfall. Oh well. At least we knew the way back would be easier! Things were looking good for tomorrow’s summit attempt. We finished our hike and headed to the Bavarian Lodge for a refreshing drink. Sunday was “summit day.” We were told that few people these days bothered going the long way around, via Bull of the Woods. Instead most headed straight up to the summit via the Wheeler Peak trail, then back down the way they came to the main trailhead, an 8 mile trek. We had opted for a more “challenging” route, so our total round trip would be 12.5 miles. It would make for a longer day but better scenery. 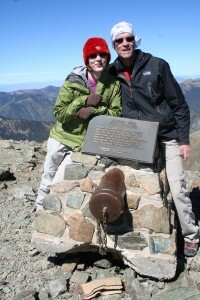 We would be starting at 9,400 feet and ascending to Wheeler Peak at 13,141 feet. Just under 4,000 feet of elevation gain. We started early, hitting the trail at about 6:40 am. The footing was good, few rocks, but steeper than I had expected. The going was fairly easy for the first few hours. Under the canopy of trees, the early morning air became quite chilly. As we got higher out on the ridge, and away from the trees, the terrain became rockier and a strong, steady wind began to blow. More than once as we approached a pass the wind got extremely powerful, knocking me about along the trail and making me work all that much harder to move forward. It seemed like it kept on for a while through several winding ridges and switchbacks. Combined with the thin air and rocky terrain, the fierce wind was an unwelcome presence. If it was this windy on the way to the summit, I could only wonder how windy it would be once we were on top of this mountain. I had stashed my fleece layer in my pack at the beginning of the hike. It seemed too bulky and I didn’t want to work up a sweat if I got overheated, but after going through an hour or more of wind I started shivering uncontrollably, even with my long sleeved, smart wool base underneath my rain shell. With the help of a fellow hiker, I got my fleece out of my pack and carefully maneuvered to put it on without losing my rain shell. Once the fleece was back on, everything was fine. The way to the summit seemed straight forward. Just continue along the rocky, windy trail to the top! Until we found ourselves facing a thin, snowy traverse across a steep slope stretching 15 or 20 feet. One guy waited there for the rest of the group. When I reached him he said “I’m not crossing! I’m turning around and going back.” I said “I don’t blame you, I’m not either!” There was a brief moment of desperation shared by us both. Fortunately with the guidance of one of our leaders, we were able to go up and around the trail with no trouble at all. The ground above it was soft and grassy, with a few rocks. I sure didn’t like that kind of exposure, and the snow I had been through earlier seemed hard and difficult to punch through with my regular hiking shoes. I was not feeling that strong and was not up for a sketchy traverse. It made me wonder why anyone would bother carving out a trail on such a steep slope with such an easy walk around available. Fortunately, that was the only section of trail like that. All other parts of the trail were directly on the ridge or along the side of the mountain as switch backs, and for the most part, plenty wide, if a bit rocky. Others in our party in front and behind made the traverse without a problem, although one guy later admitted in not quite so many words that he had been pretty terrified in the process. Someone else said they had seen a woman slip and catch herself. I shudder to think what could have happened. Within about 45 minutes we were approaching the summit ridge. We arrived at about 11:30 am. Abruptly, the wind died down as we climbed onto the plateau. It was quite roomy, with plenty of space to set down our packs and relax. And we did! What can you say about hiking down a mountain? For the most part, it’s a slog. Albeit, a beautiful one! We switchbacked over a large boulder field. Back and forth, back and forth. This route was much steeper. I was actually glad we had not come up this way. No more huffing and puffing, like on the way up, but now it was time to be careful with the knees and footing. Gotta get those trekking poles into position to take some weight. I was afraid somehow we would miss our landmark for turning off onto the trail home. Finally we reached tree line. A while later we reached the trail intersection and turned hard right onto the final trail out. Just when we thought all danger was behind us, icy patches began appearing on the trail here and there. Sheesh! Finally, the ice disappeared and the trail was clear again. We were home free! All we had to do was walk now. It was a clear path to the Bavarian Lodge and a refreshing beer! Mission accomplished.